Home > News & Events > Calling all Alumni! Contribute to Talpa’s “Sponsor-A-Student” Campaign Alumni Class Challenge today! Calling all Alumni! Contribute to Talpa’s “Sponsor-A-Student” Campaign Alumni Class Challenge today! Talpa School is currently facing a $50,000 deficit in tuition revenue. To close this tuition gap, the Talpa Alumni Association and Talpa School have created an Alumni Class Challenge as part of Talpa’s “Sponsor-A-Student” Campaign. The goal of this Alumni Class Challenge is to motivate each graduating class – from 1956 to 2014 – to raise at least $1,000 by May 15, 2015. Your participation in the Class Challenge will help ensure Talpa remains strong and able to serve future generations of students – just as we have since 1951! Donate today and track the “Sponsor-A-Student” Campaign Alumni Class Challenge at www.ourladyoftalpaschool.org/support-us/ways-to-give/sponsor-a-student/. Once you’ve donated, encourage your Talpa classmates to do the same. Let’s see which great Talpa class reaches the Alumni Class Challenge first! 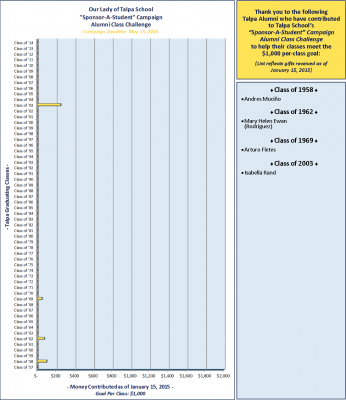 Letter from Our Lady of Talpa Principal, Sister Adella Armentrout, D.C.
To view the “Sponsor-A-Student” Campaign Alumni Class Challenge participation, please click the graph below.